They say that the first step in resolving any problem is admitting that you have one...okay, here goes! I'm a total Science geek! I love all things Science and the more technical, the better. This is why I'm so happy that I found the site called ThinkGeek.com. They have a TON of super cool gadgets, toys, clothing, etc. which definitely appeals to the "geek" in me. I reviewed the Star Theater Pro Optical Star Projection System from ThinkGeek, which retails for $169.99. On a clear night, one has only to look up to realize how much wonder is still waiting for us in the universe. Out there, amongst the stars, are secrets and surprises beyond our wildest dreams. Well why not, while you're working on your own way of getting up there to the stars, bring the stars down to you? With the Star Theater Pro Home Planetarium it's as easy as a button press. 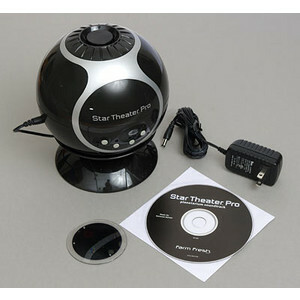 The Star Theater Pro Home Planetarium is the coolest little optical star planetarium for the home you'll ever find. It will make you feel like you are sailing through the cosmos. Just turn it on in a dark room (aimed at your wall or ceiling) and begin gawping. You can set the stars to move (1 revolution per 10 minute period), so you actually feel like you're outside. You can set a nap timer (so the unit will shut off after 15, 30, or 60 minutes once you are asleep). Behold, the stars. Enjoy an amazing starry night view in the comfort of your own home with this pro series planetarium. Battery or AC power options. I have always loved the planetarium and how you could sit under the stars in the comfort of a dark, quiet room. This is why it was a total no-brainer for me to choose the Star Theater Pro from ThinkGeek.com. How cool would it be to be able to bring the wonder of space right inside your own four walls to enjoy whenever you please? I was very happy to find that the Star Theater Pro was easy to set up. Either use 3 "AA" batteries (not included) or the AC adapter (included) to power up the unit and then push the on button. Then, select which disc you'd like to view. The Star Theater Pro actually comes with two: stars only or Earth, Moon, Sun and stars. I really preferred the second disc. The one with stars only didn't seem quite as magnificent. Once you've selected your disc, simply push the open button on the front of the Star Theater Pro so that the tray will pop out. Place your disc in the tray (UMI side up) and close it. Next, remove the lens cap from the top of the unit and focus the display by turning the black disc around the lens until your image is crystal clear. You can also choose to have the image rotate ever so slightly which then makes the whole view look REAL! 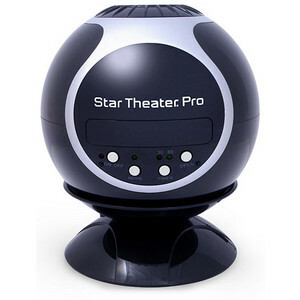 The Star Theater Pro also comes with a CD containing planetarium music to complete the whole at-home planetarium experience as well as a 30 or 60 minute timing feature, which automatically shuts the unit off after that designated length of time. I really enjoyed this machine and wish that I could use this in my bedroom and sleep under the stars! My husband has a real aversion to light or music of any kind while he's trying to sleep, so unfortunately I can't use it there, but I will be setting this up for Riley in her room so that she can enjoy the Star Theater Pro when she goes to sleep. I have only two criticisms for the Star Theater Pro Optical Star Projection System and both of these are merely design suggestions which I think would make this unit even better. First, I wish that this machine had a place where you could store extra discs in the unit itself. I don't want these high resolution discs to become scratched, lost or damaged and wish that there was an easy drawer or other place to store the discs in the Star Theater Pro. Finally, I wish that this unit had a mini-CD player or mp3 player inside of it which plays the planetarium music and/or narration. This way, you wouldn't have to worry about having a CD player as well and the Star Theater Pro would truly be a self-contained, at-home planetarium! I highly recommend the Star Theater Pro Optical Star Projection System from ThinkGeek.com! This is a wonderful item for anyone who loves outer space or wants to sleep under the stars. I also urge you to check out all of the really unique and cool stuff that ThinkGeek has to offer. If you yourself have a little "geek streak" in you or know someone who does, you are guaranteed to find many items on ThinkGeek.com which you just can't live without! Disclosure: I received the Star Theater Pro Optical Star Projection System from ThinkGeek in order to facilitate my review. No other compensation was received. This product review is based on my own personal experiences with this item and is completely honest and objective. I have to agree that this is a great star projection system that rarely gets a bad review. However, just as with buying any other piece of astronomy equipment (or other gadgets), you also need to consider what it’s going to be used for. Melissa makes some good points about having the projector in the bedroom, or not, and that it would be nice if the projector had the ability to play music for a more complete planetarium experience. There are many different styles of star projectors out there, including ones specifically designed for small children, others which focus on education and others that you can play music through. Choose carefully to suit your needs and, time after time, you will always enjoy stargazing in the comfort of your own home. Hi I was looking to buy the Star Theater Pro Home Planetarium through ThinkGeek. You should a video of how it looked for the sun, moon, and other planets. I was just wondering how the star disc worked? I was looking at the Laser Stars Projector through ThinkGeek. I liked how it sounded with the stars and I like the gaseous blue clouds. Is the star disc on the Star THeater Pro like this or is it just stars. Do they move and have shooting stars? I just want to pick the best one since it is a gift. Thanks so much for stopping by! The star disc is included, but I didn’t notice any gaseous clouds along with the stars. There was just a bunch of white stars displayed on the wall or ceiling. These stars rotate slowly around as the disc turns, but there aren’t any shooting stars or anything like that. Personally, I didn’t care for the star disc as much as the planetary disc I showed in my video. If you have any other questions, please let me know.